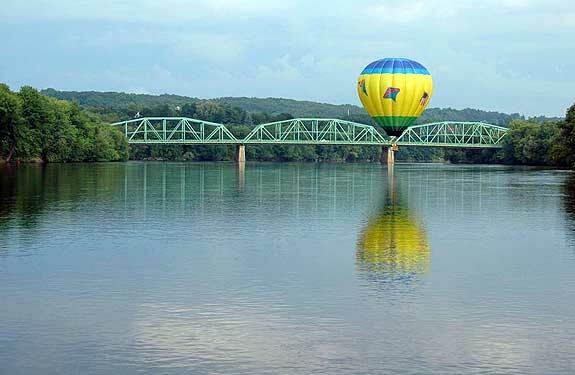 Balloon over the Androscoggin River Bridge, Lewiston-Auburn, Maine. These “twin cities” of Lewiston and Auburn, the largest cities in Androscoggin County, are also sometimes referred to as the “L-A of the East.” The Lewiston-Auburn area of Maine, the second largest community in the state, is located in the south-central portion of the state. It is approximately 35 miles north of Portland, Maine’s largest city, and about the same distance southwest of the state’s capital city, Augusta. The twin cities are separated by the Androscoggin River, with the main hub known as Great Falls. With Auburn to its west, nearby cities east of the Lewiston area, from north to south, include Turner, Leeds, Wales, Greene, Sabattus, Lisbon, and Durham. Auburn’s other neighboring cities, from north to south, include Mechanics Falls, Minot, and Poland. The original people in the area were from the Androscoggin tribe of Native Americans. In 1768, the new settlers in the area named the location “Lewistown” after the late Boston-based merchant and proprietor of that land, Job Lewis. They originally settled east of the Androscoggin River near what was then called Twenty-Mile Falls. Residents eventually learned to harness the power of the falls, building a dam, a canal, and textile mills surrounding the falls and the river. Lewiston grew into a city primarily because of the employment provided by mill owners, along with construction of the canal system, a railroad, and development of Lewiston’s commercial center. The early 1900s saw expansion into suburbs, as more people built their own homes outside the city limits. As of the 2010 census, Lewiston was the second largest city in the state of Maine, with a population just over 41,000. The original people in the area were from the Abenaki tribe of Native Americans. While Auburn was first settled in 1786, it officially became a city in 1869 – and it was the very first recognized city in the state of Maine. As the twin city bordering the falls area across the Androscoggin River from Lewiston, Auburn joined in the harnessing and development of waterpower, contributing to the amazing industrial growth of both cities. In addition to its designation as the first city in the Pine Tree State, Auburn was also known as a city of “firsts” in other categories, including the first railroad and railway transportation system, first airport, first steam automobile, and the first New England city to install fluorescent streetlights in its downtown area. As of the 2010 census, Auburn’s population was just over 23,000, making it the fifth largest city in Maine. Museum L-A, featuring the history of the textile industry in the area. Bates College Museum of Art. Atrium Gallery, at the University of Southern Maine (USM) campus. Androscoggin Historical Society and Museum. Knight House Museum, featuring an early handwork shoe shop. Saints Peter and Paul Basilica. Bates Mill Complex, with many of the old textile mills refurbished and used by modern businesses. The twin cities also feature their respective well known colleges and a local campus of the University of Maine system. Lewiston-Auburn is home to the Central Maine Community College, as well as prestigious, private Bates College. Lewiston hosts a local campus for University of Southern Maine (USM). You don’t want to miss one of Lewiston-Auburn’s major annual events: the Great Falls Balloon Festival! Held in August every year, the colorful and exciting event features over 40 hot air balloons, one of the largest balloon festivals in New England. This annual event features local, state, national, and international films, shown at various locations in the twin cities. The event concludes with an awards ceremony. This annual event began in 2009 as a run/walk/cycling fundraiser for cancer research. The event, sponsored by Lewiston native Patrick Dempsey, attracts famous athletes from around the world, including Tour de France members. All proceeds from the event go to Cancer Hope at the Central Maine Medical Center. The L-A area features year-round recreational activities. The numerous lakes, ponds, and rivers offer swimming, fishing, and boating activities. Winter activities include ice-fishing, skating, ice hockey, snowmobiling, and skiing. The twin cities also offer a number of golf courses, bike and walking trails, and a bird sanctuary. Fitness enthusiasts can also enjoy tracks for walking or running. The twin cities offer a variety of lodging choices, from quaint bed-and-breakfast establishments and cabins, to hotels, motels, and inns. Two of the more well-known lodging facilities include Marriott’s Residence Inn located within easy walking distance of department stores, malls, and restaurants; and the beautiful Hilton Garden Inn next to the Great Falls. In addition to the usual fast food restaurants found in most cities, like McDonald’s, or restaurants like Longhorn’s and Ruby Tuesday, Lewiston-Auburn also offers a wide assortment of over 80 fine dining establishments covering many popular cuisines to enjoy. You can find restaurants serving nearly “A to Z” cultural favorites, from American and Asian, to Greek and Italian, to Mediterranean and Thai food. Whether you want a casual or family dining atmosphere, an elegant, romantic ambiance, or a pub – you will find it all in the Lewiston-Auburn area. Some of the area’s favorite, renowned dining establishments include Davinci’s Eatery, located in one of the refurbished textile mills; the Village Inn Seafood Restaurant; and Rolandeau’s Restaurant. Whether you decide to visit for a day, stay overnight, or spend a vacation in the Lewiston-Auburn area, you won’t be disappointed. You will find food, fun, lodging, activities, attractions, and lots more in the famous Lewiston-Auburn area of the Pine Tree state of Maine. Visit the following directories to find lodging, dining, attractions, shops, services and recreational activities in the Lewiston, Maine area.